Major Henry De Burgh Adams became Grand Master of the G.L. of New Zealand. Not too much was conducted in the way of rigidly formal celebrations for this commemoration and it was obvious that, when the members of De Burgh Adams Lodge party, they sure know how to party. For three days there were inter-social activities, tours, visits, revelry and, on the Saturday night a 150th anniversary birthday party that Ozzy Osbourne would have been unashamed to be part of. Freemasonry likes to consider itself a progressive science and De Burgh Adams Lodge certainly fits that criteria as, in a considerable break with tradition, the salutation to its consecration in 1865, was opened to non-Masons, wives, girlfriends, family members, and members of the public. No Masonic regalia was worn, but the basics of regular Lodge ritual were observed. 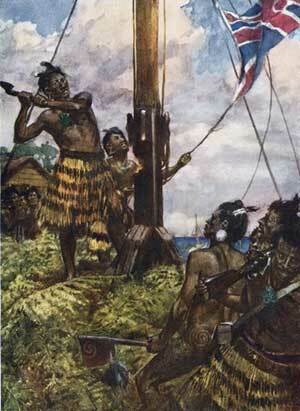 February 6th dawned cold in Dunedin as the raiding party from Lodge St. Patrick found themselves boarding the dew covered Air New Zealand flight to New Plymouth. All aboard appeared in an ebullient mood as the ATR-72 turned north over the blue-green patchwork of the Taieri Plains and were well rewarded when the turboprop aircraft bumped its way through the low cloud into dazzling white sunshine. The traveller’s jovial banter was a constant all the way to their destination. The virtually featureless plain of New Plymouth Airport greeted the members’ arrival with a wall of heat, and those dressed for Dunedin’s climate were soon shedding their onion-skin layers. Bags collected, there was a scramble for the air-conditioned sanctuary of the bus ferrying the 21 strong contingent to the motel. Keeping the orientation period to a minimum, within an hour the party was starting with an agreeable lunch at ‘The Black Harp’, a lively Irish pub featuring County Wexford-accented waitresses, and an interior the colour of Guinness. 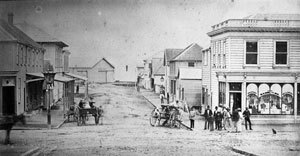 The Masonic Hotel (left), Brougham Street, was an early home of the Lodge. By late afternoon the cardinal points of New Plymouth, and a few in between, had been reconnoitred, yet everyone found their way to De Burgh’s Lodge rooms for the planned meet and greet at 6:30. It proved a lively affair with Masons meeting mates they had seen only 10 days ago, while others, due to the rarity of the occasion, were reunited with friends they hadn’t set eyes on for 10 years! The get-together continued on and all the while buzzing in the background, De Burgh Adams’ stewards flitted from person to person, ensuring that the whole affair was well lubricated with coffee, beer, fine wines, and the occasional measure of fiery Jameson’s Triple Distilled Irish. By late evening, small bands drifted away with a least two of these independently discovering Peggy Gordon’s Celtic Bar in the city centre. For the uninitiated, Peggy’s is an extremely energetic establishment, and all that can be said is that it seems to go on serving until there are no consumers left standing. Next day dawned hot and suddenly everyone was up and about, with surprisingly few showing signs of wear-and-tear – at least outwardly. By nine all was underway again. A group of Masons took their wives shopping (probably to atone for their sins), others visited the lovely parks and many attractions the town has to offer, while a contingent took a trip around the north Taranaki area, taking in sights and visiting places, including the jewellery manufacturer, Ringcraft Moana. Specializing in pearl and diamond arrangements, their studio is very interesting, but exceptionally dangerous if one’s wife is within a wallet’s distance of the till. Most of the guys on that tour breathed much easier when the next stop proved to be Taranaki’s macadamia nut factory, Emacadamia. Equally entertaining, but with much more affordable ‘gifts’. The New Zealand Herald announced the Lodge’s consecration in February 1865. 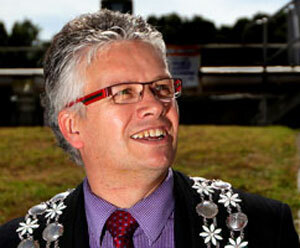 Mayor of New Plymouth, Andrew Judd, addressed the audience at the 150th Anniversary. On return the cool of the Lodge rooms proved a haven for those escaping the heat of the afternoon, and this signalled the start of the main event preceded by drinks and a delicious buffet luncheon in the refectory. By 3:30pm the Deacons and Wardens of De Burgh Adams had rounded up all their errant charges and seated them in the Lodge’s Temple, where the two hundred-plus souls assembled were heartily welcomed by the Master of the Lodge, W.Bro. Gary Brieseman. The Worshipful Master (W.M.) next invited the Mayor of New Plymouth, Andrew Judd to say a few words and the Mayor described how a city such as New Plymouth could not function as healthily, without the input of organisations such as Freemasonry freely giving of their time for those less fortunate, assisting on a broad front with charitable donations, and other relief for those distressed. He congratulated the Lodge on its sesquicentennial and, with obvious high hopes, wished it well for the next 150 years! To fill in some background for those assembled, Lodge historian, Bro. Dudley Burrows, gave the audience a précis of the formation of De Burgh Adams. 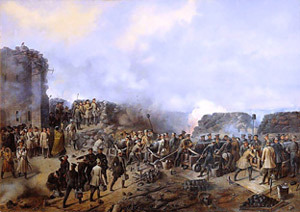 Dudley explained that toward the end of the ‘New Zealand Land Wars’ in January 1865, a group of Masons, members of the Imperial Army, made application to R.W.Bro. Major Henry De Burgh Adams (1830-1869) to “open and work [the ritual of] an Irish Freemasons’ Lodge”. Major De Burgh Adams was a stalwart advocate of Irish Freemasonry and, on February 8th 1865, De Burgh Adams Lodge was constituted and dedicated becoming No. 446 on the Roll of The Grand Lodge of Ireland, Dublin. Peculiarly, but no doubt due to his other commitments, both military and Masonic, Henry De Burgh Adams was not present at the Lodge’s dedication and never actually visited before he was posted back to England in November 1866. The first Worshipful Master was W.Bro. Richard Luke Castray, followed in the 2nd term by military surgeon, Captain E. F. Hemingway who, like Henry De Burgh Adams, was a veteran of the Crimean War (1853-1856). The Master, W.Bro. Brieseman’s first presentation was that of a cheque for 15,000 dollars to Heather Koch, Director of Nursing & Support Services at Hospice Taranaki. Heather said that she was thrilled to receive a cheque for such an amount, and she thoroughly thanked the Lodge for their donation, and not just for the help they give to the Hospice but also for the work that they frequently undertake within the community. Heather explained that the money would be used to purchase special air mattresses in the inpatient unit, and for much needed laptop computers for the Hospice’s community nurses. Later in the afternoon the Provincial Grand Master, Rt.W.Bro. Roly Whyte, presented three stalwarts of De Burgh Adams Lodge with surprise promotions to Grand Rank from the Grand Lodge of Ireland in Dublin, in recognition of their dedication. Not mentioned in the Programme of Events, this came as something of a shock to the recipients and a pleasant surprise for the audience. V.W.Brothers John Dormer, Ken Pentecost and Errol Tuffery, each received the G.L. rank of Past Grand Almoner for their unsung work within the community and “efforts above and beyond the call of duty” for many years for their own Lodge. Such men do not crave acknowledgement and, visibly flushed with embarrassment as G.L. certificate, a beribboned parchment scroll, was handed to him, Bro. Dormer was heard to quietly say, “This should go to someone else. I don’t deserve this.” The Provincial Grand Master replied emphatically, “Oh YES you do! And anyway, it’s too late now – it’s got your name on it!” The exchange drew laughter, applause, and not a few tears, from those in the crowd. The moment was especially poignant for the Gudgeon family as, in the audience, his daughter and two young grandchildren were present to witness their respective father and grandfathers’ award. Many of the ladies present who, obviously, had never before seen Freemasons of note receiving any recognition for their services, later confided that they were quite affected by the ceremonies. On Saturday night the amalgamated throng of Masons, wives, friends and visitors packed out the New Plymouth Club. The dinner was excellent and the hosts let no one want for anything. Much laughter was heard, and around the multiple dinner tables many tales were told, while the North Island’s vineyard owners rubbed their hands with Shylock-esque glee. The dance floor was jammed with fun-loving figures cavorting to music from every memorable decade. In the middle of the proceedings (but surely not alcohol induced) a massive conga suddenly materialised but gradually developed more branches than Woolworths. Another oddity occurred later still when over 50% of those on the floor unexpectedly developed terminal dyslexia while dancing to the disco anthem ‘YMCA’. The members of De Burgh Adams Lodge are lucky to live in such a lovely environment. For those who have never seen it, the city of New Plymouth, on the west coast of New Zealand’s North Island, is known for its sunny climate, art galleries and beautiful parks. And, although it’s not obvious, it is also New Zealand’s ‘oil town’, with offshore rigs extracting natural gas and oil from deep below the earth. A sleeping dragon – the volcanic peak of Mt. 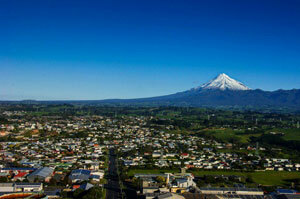 Taranaki dominates the cityscape. 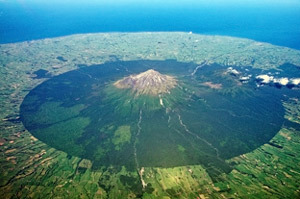 The striking circular structure of Egmont National Park is clearly visible from the air. Dominating the district, the 2,518 metre volcanic cone of sleeping Mount Egmont / Taranaki provides a dramatic Prussian blue backdrop to the landscape. It is the granite guardian of the glorious Egmont National Park, a circle of protected territory of natural wilderness 9.6 kilometres in radius from the volcano’s snow-capped summit. Mount Taranaki last erupted just 260 years ago – a nanosecond in geological time – and, according to its recorded seismic cycles, the next eruption of this stratovolcano is 70 years overdue. It is only rated therefore as being “quiescent” by geologists. The region thus possesses the curiously thrilling phenomenon of owning its very own dosing dragon, one visible to all. The city’s waterfront features Puke Ariki, a superb museum and heritage centre, and Pukekura Park with its zoo and bush walks, are places to explore or relax in and during their free periods many of the visitors took advantage of them. In fact the region is a rare place in the world where one can snowboard, ski, water ski and surf, all in the same day! Meanwhile several of the “n’er-do-wells” attending the celebrations were spotted strolling along the New Plymouth Coastal Walkway, an 11km promenade featuring striking views of the Tasman Sea and the busy comings and goings of curiously configured maritime vessels plying their trade. The promenade also just happens to include good shops in an interdependent relationship with an impressive selection of restaurants, bars and pubs. Well, what’s a bloke supposed to do if his woman’s disappeared off shopping?! 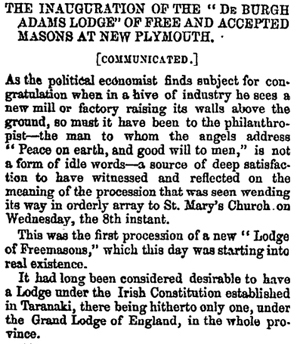 At 10 o’clock on Sunday morning, 8 February 2015, a sizable contingent of Freemasons representing not only the four Irish Lodges but also the four constitutions, together with their wives and girlfriends, converged with the substantial congregation for the service at The Taranaki Cathedral Church of St. Mary in Vivian Street near Brougham Street. 150 years to the day of the consecration of De Burgh Adams Lodge, the Cathedral’s Dean, the Very Reverend Jamie Allen, made a special mention of the many Freemasons in attendance. He described to the surprised congregation how, on the afternoon of 8 February 1865, all of the Brethren of the new De Burgh Adams Lodge had marched across the road (Mostly they were men from military units.) from the ‘borrowed’ Mount Egmont Lodge, Brougham Street, to the Church of St. Mary to invoke divine blessing on the new Worshipful Master, W.Bro. P. M. R. L. Castray (see above), the Lodge’s members, and their new Lodge. 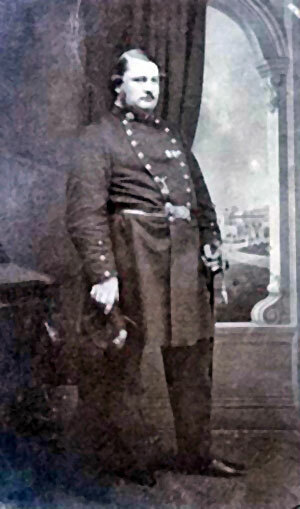 The 1865 Service was conducted by the Lodge’s Chaplain, the Reverend H. H. Brown. The blessing completed, without further ado, they marched back to close the Lodge to partake of dinner at The Masonic Hotel, Brougham Street. 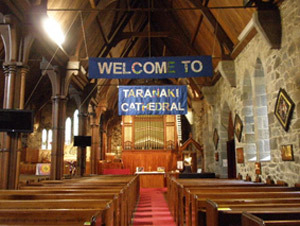 Taranaki Cathedral is testament to the art of the master stonemason. V.Rev. Allen explained that thus, since 1865, the two institutions of the Church of St. Mary (now Taranaki Cathedral) and De Burgh Adams Lodge No. 446 Irish Constitution have been closely linked. 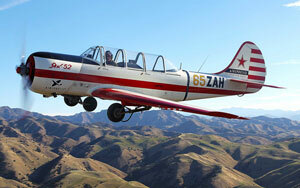 Popular NZ TV weatherman Jim Hickey (retd) regularly flies from New Plymouth Airport. V.Rev. Jamie Allen conducted a very pleasant church service with one highlight the choir singing The Lord’s Prayer in Māori and their being spontaneously joined by many of the parishioners. Morning Service completed, a long line of people, male and female, inextricably linked by the world’s most ancient fraternal Brotherhood, wended their way to their respectful points of departure. Many handshakes and some big meaningful hugs were exchanged. With some sadness the four Irish Lodge’s members began to accept that by mid-afternoon our groups would have to, yet again, set sail for home. We are a tight bunch and departure can sometimes be a bit of a wrench. Nevertheless we are ever optimistic that we’ll all meet again aright.